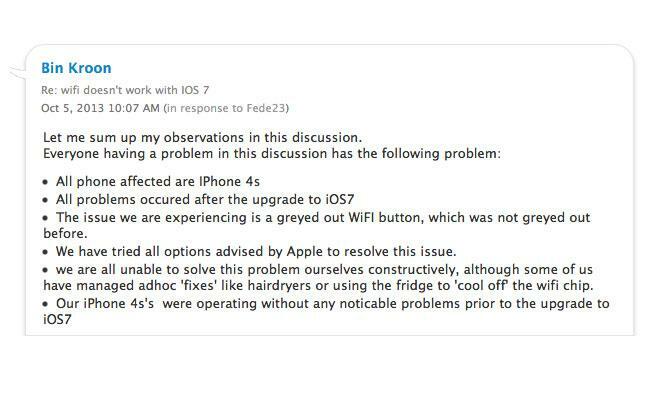 The issue reportedly causes the WiFi option in the iPhone 4S's Settings app to become unavailable, or "greyed out." Other iOS devices  including the iPhone 5, iPad 2/3, and iPad mini  are also cited, though sparingly, as being affected. Many users report that cooling down their handset's hardware by placing it in a refrigerator or freezer for a few minutes temporarily resolves the problem, pointing to heating issues as the likely culprit. Users speculate that either a long-running Wi-Fi process  like that enabled by iOS 7's new background data transfer features  or a balky firmware update for the phone's WiFi controller are to blame. The iPhone 4s uses a Broadcom BCM4329 WiFi and Bluetooth controller, according to a teardown by iFixit, the same chip likely used in the iPhone 4. The BCM4329 is a popular choice for mobile applications, where it may be in use in hundreds of millions of popular mobile devices  processor analysis firm Chipworks estimates that the chip was found in more than 50 million devices in the fourth quarter of 2010 alone. For Apple's part, there seems to be there seems to be a break in communication between Apple headquarters, its customer support staff in different countries, and its carrier partners around the world. Some users say that upon contacting Apple, they were immediately given a replacement handset regardless of their current warranty status, while other say they were advised that they would need to pay $199 for a refurbished replacement device. Affected customers who contacted their wireless carriers, rather than Apple directly, say they were met with replies that the problem is "known" and that the Cupertino company is working on a fix, though no timetables were given. The same issue was reported during last year's rollout of iOS 6, when a 91-page thread  now repurposed for discussing the issue as it relates to iOS 7  appeared in September. Many users at that time found the problem could be resolved by downgrading to the previous iOS release, something that is not possible with iOS 7.